My friend Grasie of Style Me Grasie is getting married in June, and her bridal shower was last weekend. 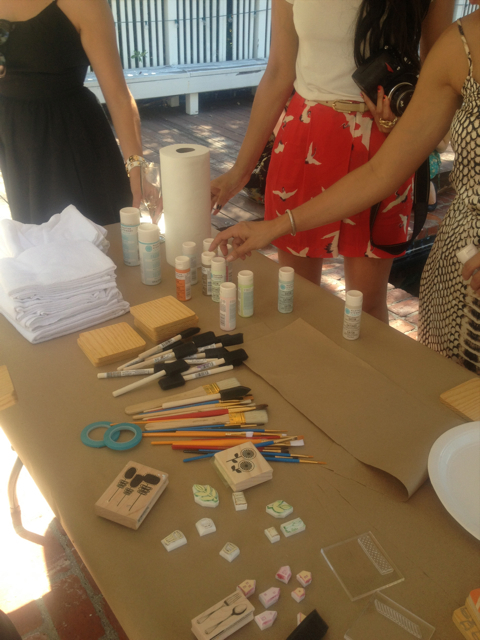 When she asked me to help with a group craft project for her shower, I said, "OF COURSE!" The lovely hostess Naomi wanted everyone to make things for the bride and groom, so I brainstormed and decided on 2 projects: Stamping wooden coasters and tea towels. I made the coasters out of the same wood I am using to make Grasie's wedding table numbers, some lovely sugar pine. I planed the wood down to 3/8", cut the pieces to 4"x4" and rounded the corners. For the tea towels, I got some flour sack towels from amazon. I got some kitchen-themed stamps from Michaels, and also from a wonderful shop on etsy called Talk to the Sun. I got 3 sets, some flowers, glasses, and houses. I wanted to buy his whole shop, the stamps are all so amazing! Great quality handmade rubber stamps, all thick enough that they need no backing! 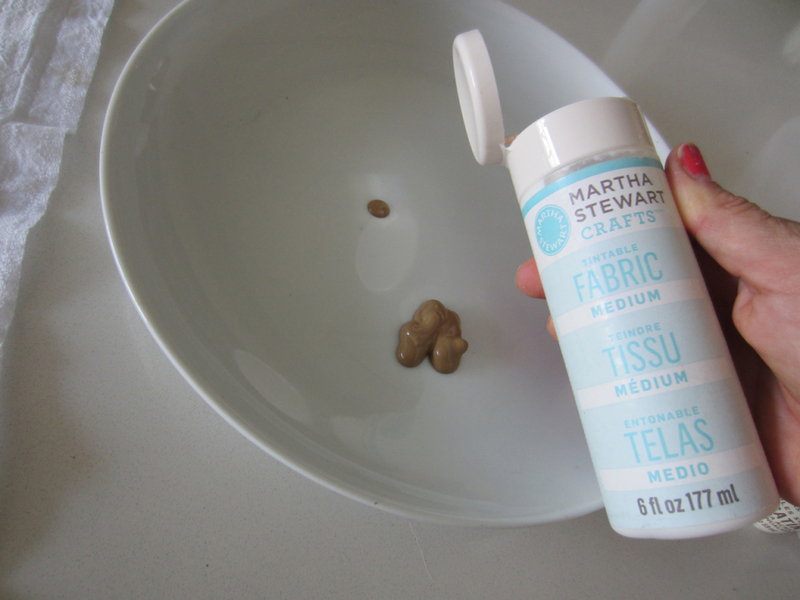 I got a whole bunch of Martha Stewart acrylic paint and fabric medium, some paintbrushes and foam brushes, and off I went to the shower! Everyone got really into it and had a great time. It was a great way for people who didn't know each other to interact, and we were left with some great momentos of the day for Grasie and her fiance, Damien. 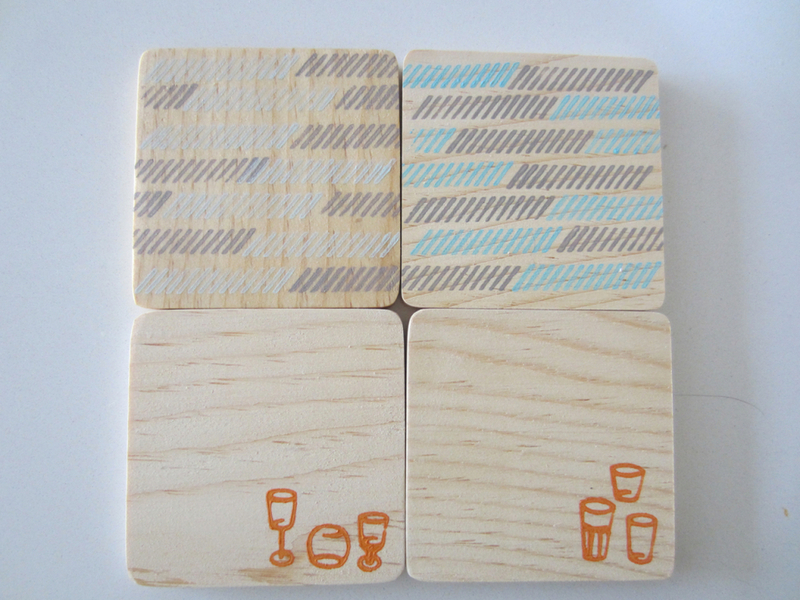 For the coasters, I used Martha Stewart acrylic paint on raw wood. I squirted a small amount onto a plate and then used a foam brush to dab on the paint. I found this method works much better than dipping the stamp itself into the paint, the paint is more evenly distributed. Then with a steady hand, stamp! I like to repeat patterns and with the other stamps I like a more minimal approach. After those were all done, I coated them with polyurethane to ensure water resistance. You can see the ones from the shower in the background. Now for the tea towels. 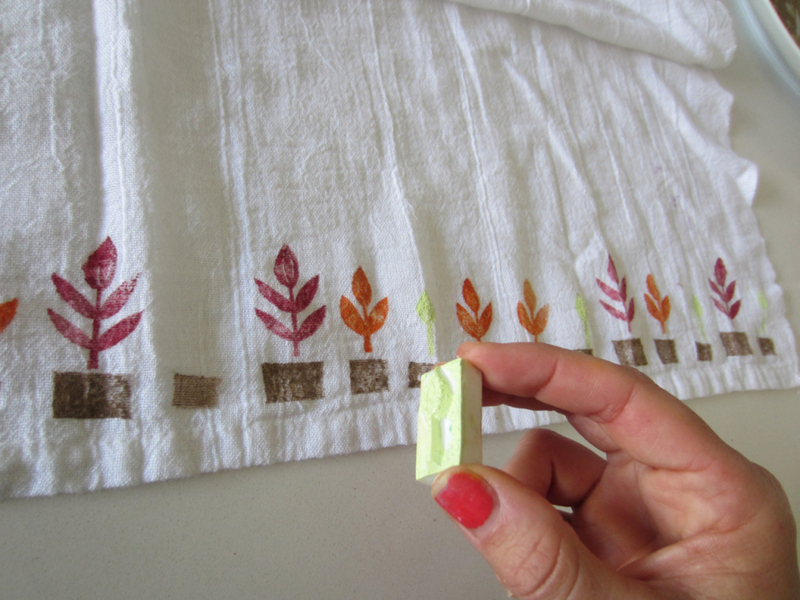 When using acrylic paint to stamp, you have to add fabric medium to the paint at a ratio of 2 parts paint to 1 part medium. 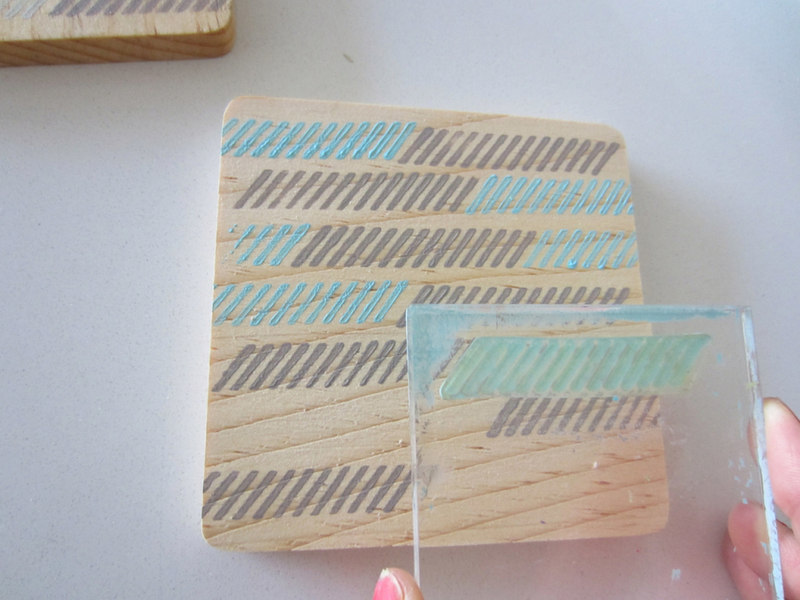 Mix it up and dab onto the stamp with the foam brush like I did with the coasters. Again I used repeating patterns. For the fork and spoon pattern, I chose a monochromatic theme with one small pop of color. After the paint dries, it must be heat set in order not to wash out. Iron the back of the fabric for 2-4 minutes or place in newspaper or a paper bag and then into a 350 degree oven for 15 minutes. Then wash on cold and tumble dry. I tested one out, and the stamps look even better once the towels are washed. Brilliant! For more images of the shower, visit Grasie's blog post about it here.